UPDATE: as of February 18, 2014, ICANN has released a new CIR form that is designed to be more user friendly. Guidelines addressing the new CIR have been posted on ICANN's website. This new form should not affect any applicant who has already successfully submitted the CIR. However, for those currently filling out the CIR, their data should be transferred onto the new CIR form. The main changes to the CIR include: removing the COI section and Exhibit A section. Although these sections are no longer included in the CIR, COI information and any declarations of cross ownership must still be provided through cases in the CSC portal in order for the overall contracting process to move forward. The one element that seems to be added to the new CIR is a Billing Point of Contact section. See Contracting Information Request summary and example. CIR invitations go out on Wednesdays. An applicant will have 9 months after receiving the initial CIR invitation to enter into a Registry Agreement with ICANN. Applicants may also request an extension of this period through the Customer Service Portal (CSC). Applicants who have already received CIR invitations will start their official 9 month period on Wednesday January 29, 2014. New information from ICANN Singapore suggests that the time between filling out the CIR and executing the RA could take as little as 3 weeks. However, as many as 61% of applicants "are processed within 41 calendar days." Note: ICANN's estimate of 7 days represents how long it takes ICANN to create and process the RA internally. However, because applications are processed by priority number, this step may take longer. Taking this into account, new ICANN data suggests that the average execution time for the RA once it is send to the applicant is 13 days, possibly due to renegotiation and other delays. Registry Onboarding takes place in steps throughout the contracting process. Contact Sheet - Establishes appropriate contacts for various contingencies. Onboarding Information Request (ONB-IR) - Can be established concurrently with PDT, but must be completed prior to Delegation. Includes information on Zone File Access; Bulk Thin Registration Data Access; Data Escrow Registry Reporting; URS; EPP; IDN Tables; SLA Monitoring. The ONB-IR is sent out as a text file and must be submitted as a text file, unlike other documents ICANN asks registries to submit. Registries also must submit individual paperwork for each new gTLD. New information given in a recent Applicant Update Webinar stated that while step 1 of Registry Onboarding was expected to be completed simultaneously with PDT, many applicants are not ready to submit or have not already submitted the ONB-IR information by the end of PDT. This may increase the time it takes to reach delegation. 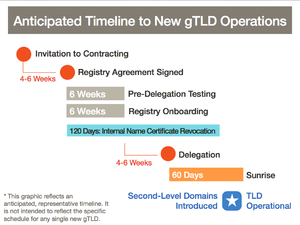 ICANN suggested timeline: Integration Testing must be completed before TLD Startup Information can be submitted. It does not need to be completed before PDT. Certification that one has passed TMDB Integration Testing is a necessary component of the TLD Startup Information. To begin TMDB Integration Testing process, use the new gTLD name and registration token to register on TMDB's website. Download a SMD Revocation List. Upload a Sunrise LORDN file with at least three (3) domain names that have been validated using the "testing SMDs" generated by the Trademark Clearinghouse; retrieve the related LORDN log file. If the connection to download the CNIS appears to be hanging check your source IP matches the ACL IP in the CNIS TMDB Test Profile. For step by step instruction on TMDB Integration Testing, see ICANN's TMDB Registration and Platform Access Process Document or the Registry User Manual Version 2.3. TMDB Integration Testing does not have to be completed before PDT; it only needs to be completed before submitting TLD Startup Information. Exemption for additional TLDs can be applied for after three (3) certification passes, see  for the template, populate section 1 only and email the .doc file to IBM. The current PDT capacity is 20 testing slots per week. The number of testing slots can be increased if there is advanced notice; however, the PDT system has not yet reached or exceeded weekly capacity. PDT invitations go out on Fridays, appointments are confirmed on Tuesdays, and results are released on Thursdays. In a recent GDD webinar, ICANN staff estimated that the average length of PDT from starting PDT to receiving results has been 3-4 weeks, as opposed to the previously suggested 6 weeks. 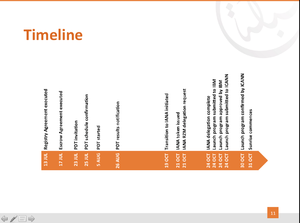 Applicant timeline examples: 17-24 days, with an outlier of 39 days. 21 days, Aug. 5-Aug. 26; DotShabaka. Yasmin Omer has explained that as the first applicant to go through PDT, their experience should not be taken as indicative of current ICANN processes. 39 days, Jan. 13-Feb. 20; for Top Level Design's .ink. Changes to the PDT Process may be made by ICANN, possibly regarding data escrow, in the coming months; those applicants who have already completed PDT will not be held accountable for new or differing requirements. Be prepared to complete any additional ONB-IR requests during PDT. Applicants need to use a specific PDT encryption key for testing Data Escrow services. Transition to Delegation sequence, including the statuses of registries in the Delegation Process as of March 2014 presented at ICANN 49 in Singapore. 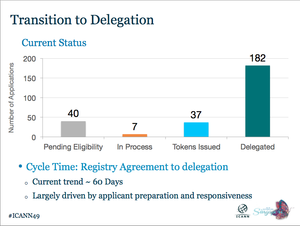 In an ICANN 49 presentation, it was stated that an applicant would normally receive a delegation token about a week or so after the successful completion of PDT. Generally, Delegation POC requests are sent out on Tuesdays and Delegation Tokens are sent on Thursdays. See ICANN's Customer Portal User Guide: Transition to Delegation PDF for specific instructions. Know that every contact provided by the registry to IANA will be contacted and must respond from each email account listed, even if the accounts belong to the same person. Make sure the appointed delegation POC is prepared to receive the pin via email. IANA will ask for the name of the organization, the name provided by the delegation POC must exactly match the name on the RA; if it does not, it will fail IANA's verification mechanisms. If you receive a notice from IANA regarding a technical failure on the part of the registry or its credentials, there may not be a need to panic. IANA's verification and checks are designed to be conservative and may result in false positives. If you are notified of this kind of failure, contact IANA. Manager: also know as the "Registry" or "Sponsoring Organization"
Some applicants have found it helpful to have TLD Startup Information prepared and ready to be submitted directly after the new gTLD is delegated. The quick 5-6 day turn around seems to be fairly consistent for delegation. Plan accordingly, and be prepared with plans for the new gTLD's website, nic.newtld. A recent webinar clarified that it is not required for the applicant to have a website at nic.newtld but that at delegation whois.nic.newtld should be set up. When listing your name servers for IANA during the delegation process, make sure you enter both the IPv4 and IPv6 addresses separated by a space. Make sure both Delegation POC and Primary Contact are responsive. Step 2 of Registry Onboarding starts at delegation. It mainly involves using the information provided in Step 1 to institute service infrastructures. See ICANN 48's Contracting and Registry Onboarding Presentation for an overview of the complete list of infrastructures set up during Step 2. Launch Program Application: can be completed anytime after the contracting process has begun and needs to be submitted to ICANN before the Sunrise Period starts. Launch Program Application (PDF) provided by ICANN. New information on Qualified Launch Plans (QLPs) is expected to be released by ICANN. There is currently a draft that is open to public comment that addresses if and how registries could allocate some of their 100 reserved names to 3rd parties for the promotion of new gTLDs. QLPs could allow applicants to give names to 3rd parties as long as the name is not on the TMCH list (unless it will be allocated to the rights holder or public authorities). It is not necessary to provide gTLD prices or pricing strategies in Startup Documents. .wiki is currently going through the new gTLD contracting program and will update its timeline as it hits important landmarks in the process. .ink is currently going through the new gTLD contracting program and will update its timeline as it hits important landmarks in the process. Note: This 39 day period in PDT seems to be longer than the averages suggested by other applicants. Note: 13 days seems to be longer than average amount of time to reach delegation based on the other timeline examples. Be sure your TLD is on the PSL so that it works smoothly with major browsers. Applicants found ICANN's customer service responses to questions to be helpful and timely. Contact ICANN through the Customer Service Portal or by emailing questions to newgltd@ICANN.org. Be prepared for important documents or notices to be sent out for completion by ICANN on Fridays. While .buzz initially received priority #746, it was the 54th string delegated. Having a higher priority number, then, may not necessarily slow down the delegation process at this point in the new gTLD program. The February Applicant Update Webinar released these statistics: applicants who signed RAs in November or December were able to reach delegation in 60 days on average as opposed to 75 days which was the average for applicants who signed RAs before November. ICANN representatives identified the decrease in time as a result of applicant responsiveness and readiness. Filing a change request can result in a 4-6 week delay depending on the change. Changing POCs can take as little as 1-2 days. Large "material" changes can result in applicant re-evaluation which can cost up to $10,000 for financial or technical changes and $2,000 for registry services, and take longer to review. Look for possible changes to the contracting process regarding name collision proceedings for delegated vs. not-yet-delegated names as ICANN has just released a new Name Collision Mitigation Report that suggests possible changes to the current new gTLD program. However, the report is still undergoing public comment. Statements made at ICANN Singapore suggest that strings that have already been delegated will not be affected by any new proposal adopted but will use the previously agreed upon name collision mitigation techniques. ↑ 2.00 2.01 2.02 2.03 2.04 2.05 2.06 2.07 2.08 2.09 2.10 http://newgtlds.icann.org/en/announcements-and-media/webinars PDF download Applicant Update Webinar, February 21, 2014. ↑ 5.00 5.01 5.02 5.03 5.04 5.05 5.06 5.07 5.08 5.09 5.10 Ondo, Crystal. Personal Communication. ↑ 7.0 7.1 7.2 7.3 http://buenosaires48.icann.org/en/schedule/mon-new-gtld/transcript-new-gtld-18nov13-en PDT Papac, Krista. ↑ 15.0 15.1 15.2 15.3 15.4 15.5 15.6 15.7 Doshier, Bill. Personal Communication. This page was last edited on 20 March 2015, at 22:22.